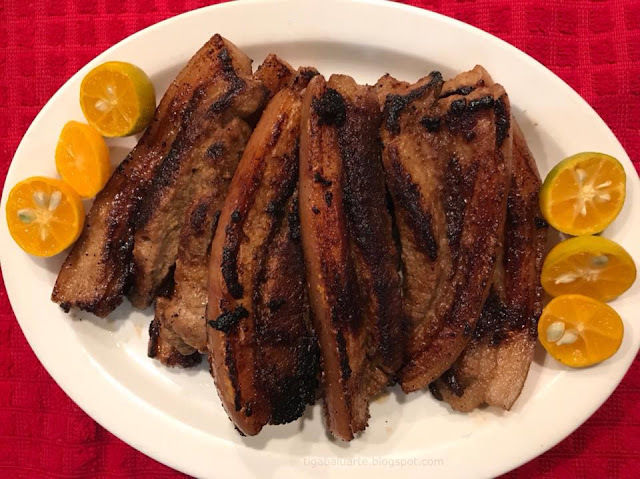 This Easy Grilled Pork Recipe is made with thin slices of pork belly and marinated using 3 simple ingredients. I used a cast iron skillet as I only cooked a pound of meat and don't really want to start the grill. It worked just fine and turned out really good. You can grill, pan sear or fry and serve hot with spicy vinegar and kalamansi for dipping. Rinse pork slices and pat dry. Set aside. In a wide container, combine soy sauce, kalamansi juice and minced garlic. Mix well. Add pork slices to the marinade. Mix well and refrigerate for a hour or two. Once marinated, drain and you can either grill or fry pork belly slices. Serve hot with spicy vinegar and lots of steam rice. Enjoy.